Hello and welcome to Swee Mei. I'm Miranda and I'm a lampshade maker. I started doing this a few years ago when, in time honoured tradition, I couldn't find the right lampshade for my home. I had some beautiful Japanese Chiyogami paper that I hadn't yet found a use for so I ordered some lampshade frames and materials and off I went. The result was so pretty and satisfying to make that I soon found myself making more. That's it down there, my first. Lampshades tend to come and go quite quickly in this house but that one will always be special to me. I now sell my lampshades online and through craft and vintage fairs as well as offering a bespoke lampshade making service. The name Swee Mei (it's pronounced 'May') is Chinese. It's my daughter's middle name. My mum and grandmother, who are Chinese Malaysian, helped me to choose it and it means Water Jasmine. I spent many of my childhood years in South East Asia and I think that is often reflected in my fabric choices. I love bold colour and pattern and I think lampshades have, for a long time, been overlooked as the ideal vehicle to introduce both to an interior scheme. 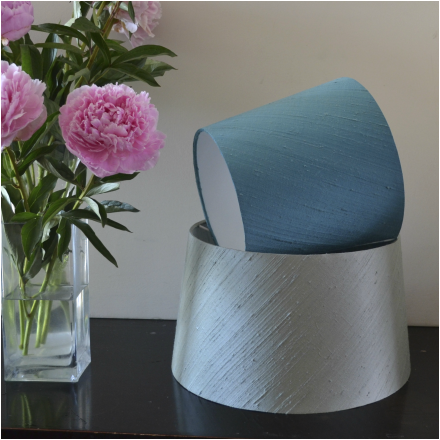 I hope you enjoy looking at my lampshade range and don't hesitate to get in touch if you need any advice on which lampshade would best suit you.